Last year we embraced the stuffies so much that my daughter's 8th birthday party was a stuffed animal party! We rented the picnic grove by the pond at Loantaka Park, and she decided on all the activities herself. Her friends each brought their own stuffed animal, and began by sitting in a circle, introducing their stuffy, and telling where they got it. Then they placed them all on a sheet, held onto the edges, and tossed the animals up in the air until they all flew off. (The volume of giggles could be heard for miles.) Next they tossed them back and forth with a partner (like an egg toss game), and took them on a hike. They made beaded necklaces for them, and decorated party crowns (made from covered half toilet paper tubes) with jewels and markers, and tied them around their animal's head. Each stuffy also got its own mini cupcake on its own tiny place setting made from appetizer plates, forks and spoons, and mini cups. Stuffy: My son's first stuffed animal, so named mostly because my son's nose was always stuffy. Dot Dog and Baby Dot Dog: Another early toy for my son. I think he chose a pretty appropriate name for him! After my daughter was born, we needed a Dot Dog for her, so Baby Dot Dog (also named by my son) joined the family. Mickey Mouse and Phillies Phanatic: These two are best buddies, and are always front and center in the lineup for the morning birthday greeting for each family member's special day. Papa Smurf: Won at Dutch Wonderland when the kids decided to pull their tickets together to win me a larger version of my favorite childhood stuffed toy, which, we thought, was gone forever. Tigger: This little guy almost didn't make it home from our trip to England a few years ago. Becca was three at the time, and refused to put him through the airport scanner. We had to pry him away from her as she went through security screaming, or we would have had to leave him behind. 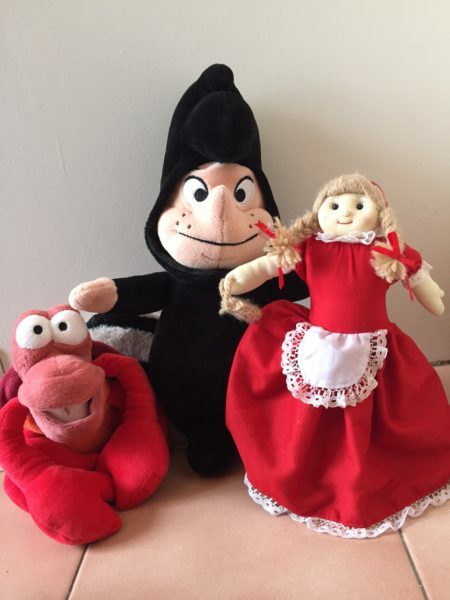 Sebastian, Tootles, and Little Red: My daughter's latest additions include stuffed animals of the characters she has played in local plays. We are on the look out for an "orphan" doll to commemorate upcoming her part in Annie, Jr. So, next time you feel the urge to purge, steal a moment to cuddle with the little creatures, take in all the memories they hold, and thank them for the gift of childhood they represent, before you toss them into the donation bag heading to Goodwill.